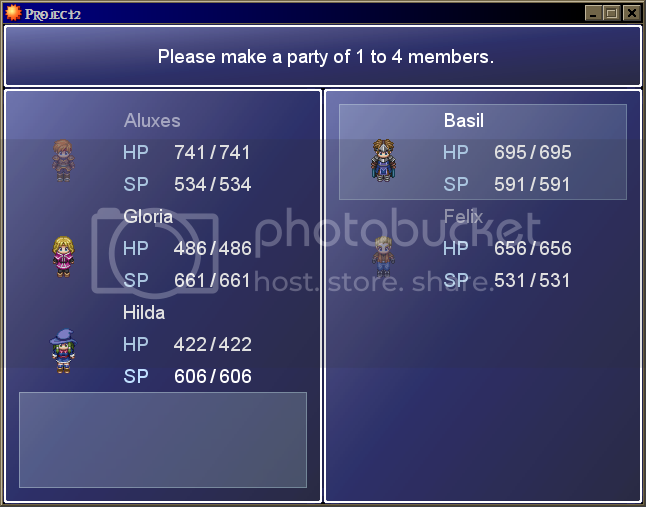 This script is to allow an easy way to add/remove actors from the party, and create a reserve party. Allows the player to make a party from the minimum to maximum size. Allows you to use the default add/remove actors command. # Instructions: Place above main, but below all other default scripts. # -Allows the player to make a party from the minimum to maximum size. # -Extra members are limitless. # -Allows you to use the default add/remove actors command. # This setup uses SephirothSpawn's coding to simplify the cursor's position. # -Removes an actor from the party, and puts them in reserve. # -Replaces the last actor in the party with the actor in reserve. # -Locks the actor in place. # -Sets the minimum and maximum party size. # their id to the array below. Instructions can be found in the header. Creds to SephirothSpawn for some help with the scrolling cursor. Additional notes are found in the script. i know how old this topic is old but i cant figure out the call script to pull up the menu in the screen shot can anyone help me out?